In this article I will put down my own thoughts on this having relatively recently been through the same process myself. Admittedly I was returning to astronomy and had a measure of knowledge from years ago. However many of the issues I faced in choosing a telescope would be the same as most beginners. I hope this guide will help YOU in choosing the right scope for your needs. A beginner looking around the market will almost certainly be swayed by glossy adverts on eBay and wonderful looking equipment often displayed in camera stores around Christmas. The temptation to buy a telescope with a promised x700 magnification can be great and when the camera store is doing a very special price its hard not to be tempted. Here's my first bit of advice - DON'T DO IT !!! Telescopes are one of the exceptions to the rule that 'you get what you pay for'. Quite often appalling junk is sold with a rather large price tag compared to a quality instrument from a reputable dealer. What looks like a shiny bargain on eBay can very often turn out to be almost unusable, or, if it's a reputable branded item it may have been mishandled by another beginner just like you. The fact is I have seen too many posts on astronomy bulletin boards where people have paid over the odds, sometimes even more than a new scope for a second-hand item that has problems or have been ripped off buying some no brand scope with terrible optics only to find out they could have bought a quality product from a reputable brand for half the price. That's not to say every pre-owned scope is a nightmare but use some sound sense and ask the seller questions and assess if they have experience. Most amateur astronomers will look after their equipment and you can find some good bargains but as a general rule it's not advisable for a beginner as they simply lack the knowledge to know what to look for. Don't imagine that telescopes are like DVD players or other commodity items that will just go when asked with plenty of support and spares. In most cases telescopes of all types require you to devote time and effort to learning how to use them. This is where buying from a reputable dealer will pay dividends in the long run. Pick a known brand. These include Sky-Watcher, Celestron, Meade, GSO, TAL, and Orion Optics but there are others. 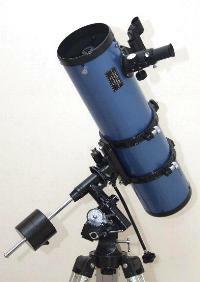 Buy from a dealer who specialises in astronomy equipment. He will be able to advise you in the purchase and support you afterwards and you may well need that support. Finally - avoid eBay and non-specialist shops like the plague you will run a serious risk of ending up with a lemon. Most astronomers when asked what is the best telescope will promote the view that it's all about aperture (in a nutshell the width of the lens or the main mirror). The larger the aperture the more the telescope (and you) can see. A larger aperture will collect more light and therefore both provide a bigger view and a view which can pick up more detail. I'll talk about magnification later in the article and why you should be dubious about telescopes promising x700 magnification. Now while the aperture argument is sound enough it does require the application of some common sense. The larger the aperture the larger the telescope becomes, this means the telescope gets longer and heavier. The larger and heavier the telescope becomes the less likely you will be to actually use it and indeed it may be that you have nowhere to store a telescope that could be 6' long and weigh 120lbs. Similarly you may be unable to transport it to a dark sky site if you live in an urban environment with high levels of light pollution. So you can see aperture is only one part of the equation and I would argue that the real requirement is actually location, location, location. The darker and clearer your skies the more you can see. A very large telescope in a light polluted environment will see less than a smaller telescope that you can take to a dark sky site. You therefore need to balance the aperture against the physical size, storage and transportation issues. Don't be fooled by collapsible telescopes that will claim you can break the scope down and fit it into the boot of a car. You may well be able to do this but a large Dobsonian style scope may well have a mirror that weighs an awful lot. Some of these can reach over 60lbs which is a lot of weight to carry. Remember another dictum of astronomy - "the best telescope is one you will use" - so try not to join 'the biggest one on the block' brigade which can end up with you having an expensive white elephant sat in your garage or spare room that never gets used. Where do you live ? If you live on the top floor of a tower block in a city your choice almost certainly needs to take into account portability. If you live in a rural location with a decent sized garden and low light pollution portability may not be an issue. Where will you use the scope ? Again if you cannot use your telescope from your own location and you buy a monster telescope that's not easily transported it won't be used. So think about possible locations. How fit are you ? How much kit can you carry/do you want to carry ? Any telescope requiring power will require you to carry a power tank (basically a large battery power supply). And all telescopes will involve you carrying other items such as red light torches, extra eyepieces and accessories so bear that in mind. Transport ? How will you carry the scope. Even if its in a garden shed in your garden if you buy a large telescope you may find its too heavy to lift about OR too difficult to set up. People with bad backs of knees should beware. A lot of this kit is heavy. Cost ? How much do you want to spend ? I would always advise a beginner to not buy more than they can afford to lose. I have seen too many people come into the hobby and buy some kind of monster sized wunderscope only to get bored, find the hobby is too challenging or simply be unable to cope with a giant telescope and end up taking a big loss. How much time do you have ? This is critical. If you buy a huge complex scope but only have a few hours a week you will get frustrated very quickly when you spend an hour assembling it only to have the clouds arrive or to run out of time. Similarly if you don't have much time to spend you may find that simply finding objects with an all manual telescope and mount takes too long and something that's a bit more automatic may suit you better. The nice thing about telescopes (at least from a passionate astronomers point of view ) is there are so many of them. So many different types to choose from in fact that it can be very confusing for a beginner. Choice is indeed a curse. In this section I'll talk you through the various types. TELESCOPE TYPES - What's the difference ? The types of telescopes discussed in this section are among the most common types available to amateurs. There are many other types available but these tend to be either very expensive or specialised towards specific needs. The oldest type of telescope design. These are the classic looking telescope. Refractors are usually quite long at around a meter in length and the most common aperture sizes are 3", 4" and 6". You seldom see refractors with a larger aperture as there is a direct relationship between the lens size and the length. As the lens size increases the length increases dramatically along with the weight, also the cost of the glass lenses rises very fast. Bigger refractors do exist but the cost is prohibitive for all but a tiny percentage of buyers. Refractors come in two basic types; Achromatic (which are an older design but less expensive) and Apochromatic, commonly shortened to APO. The picture to the right shows a TAL 100RS, a fairly typical modern achromatic telescope. APO telescopes are more expensive as their lenses are more complex and more expensive to make. So what's the difference ? Achromatic refractors are longer and can exhibit some optical defects such as false colour. This is where the lenses create colour to an object. You can see this in cheap telescopes which produce a definite coloured hue to the image. APO telescopes correct this but at a much higher price. APO types are however highly portable being much shorter than their achromatic cousins. APO telescopes also have a shorter focal ratio which makes them better suited to the needs of astro-imaging. The focal ratio of a telescope is derived from dividing its focal length (how long the telescope is) by the width of its largest optical element (either its lens for a refractor or its primary mirror for a reflector). So a refractor that has a focal length of 900mm with a 100mm aperture (4") has a focal ratio of 9 usually expressed as F9 (900/4=9) High focal ratios such as F8-F15 provide a 'slow' telescope. The slower the scope the worse it becomes for astro imaging. For visual it provides a scope which will show better definition on planets and the moon but will provide less good results on faint objects such as nebula and galaxies. This is true of most refractors as they are limited in aperture to typically no more than 5-6" compared to a reflector which can easily be 12" and still retain portability and low enough cost for the amateur. Refractors can provide beginners with a simple to use telescope, a relatively comfortable viewing position given that the eyepiece always stays more or less accessible (though when looking high in the sky you may end up kneeling down on wet grass a lot). Refractors generally work well on any bright object such as a planet, the moon or star clusters. Stars will show as tiny white perfect dots of light and a quality F10 refractor will show the moons surface and planets incredibly well. Refractors require almost no maintenance and are generally rugged enough to be suitable for children to use. NEVER, EVER leave a young child with a telescope during daylight hours. One look at the sun through even a modest telescope will result in serious eye damage and potentially blindness for life. If you do buy your child a telescope then please take care and caution them about the dangers of the sun. Children often take rather well to objects like the moon and a refractor is simple enough for a child to get to grips with. Don't be put off using small cheap telescopes where smaller children are concerned. Even the meanest of telescopes can provide a child with some wonder where a more complex telescope that's difficult to manage may actually put them off. Refractor Pros - Easy to use/maintain - Rugged and reliable - Great for planets and bright objects. Newtonian reflecting telescopes (often just called reflectors or newts) use a large mirror instead of a lens to capture light. Because a mirror is less expensive to make than a complex group of lenses reflectors offer the biggest 'bang for the buck' in terms of aperture and as a result are much favored by amateurs especially for deep sky observing of galaxies and nebula. Typical amateur reflecting telescopes range from 4" through to a whopping 16" - even larger reflectors appear in the amateur community with some owners having enormous 40+" telescopes. A more typical size though is 6" to 12" for many amateurs. The picture to the left shows a Skywatcher 130PM, a fairly typical small reflector of 5.1" aperture. It is shown here on an equatorial mounting but is offered in a variety of different versions. We'll see more about mounts later in this article. Reflectors suffer no false colour issues caused by lenses but instead because of the basic design cause a diffraction pattern. In a nutshell this means stars appear as pin points of light with a fine cross through them rather like a classic star shape. Some people find this appealing others find it annoying. Reflectors just like refractors come in different lengths and this affects their focal ratio. Most modern reflectors from commercial companies are built to be around F5 which is known as a 'fast' scope. Longer reflectors have slower focal ratios of around F10 and these are sometimes called 'planetary reflectors' or 'long tube reflectors' because their length is greater than a fast reflector. Reflecting telescopes are very often the workhorse telescope of choice for many amateurs as they offer a large performance at a relatively low cost. Reflectors offer the best overall performance for deep sky viewing of objects such as nebula and galaxies but fast reflectors don't generally perform as well on planets and the moon as a quality refractor. Mirror Mirror in the tube - what's the difference to a noob ? Reflectors can use two different types of mirror. The older design uses what's known as a spherical mirror. This has no disadvantage in a slow reflector of around F8 but it's not possible to have a fast reflector with a spherical mirror as the quality of the view would deteriorate with what's called 'spherical aberration'. Spherical aberration would make the view look as if you were looking into a distorting mirror. To allow reflectors to have low focal ratios of around F5 they use a parabolic mirror. This cancels out the spherical aberration but until relatively recently these were very expensive. Most modern reflectors employ a parabolic mirror which allows the tube length to be shorter and with advances in manufacturing the parabolic mirror is no more expensive. Its not all good news however because the faster the focal ratio of a reflecting telescope the more demanding it can be on eyepieces due to a condition called coma. Coma causes stars at the edge of the view as seen by the telescope to become slighly elongated - this is corrected in high end eyepieces but low cost eyepieces are seldom well corrected for a fast focal ratio scope. For the novice these problems are more theoretical than real. We'll look at eyepieces later in this guide. Reflecting telescopes can be mounted in a variety of ways but one of the most common types is what's called the Dobsonian (named after John Dobson who came up with the idea). A Dobsonian is simply a reflecting telescope that is mounted on a simple turntable. This arrangement allows a very large reflector to be easily and simply mounted. Most large reflectors for amateurs are Dobsonian mounted because the cost of mounting a very large telescope on anything else would be prohibitive. Reflectors mounted on an EQ mount (mounts are discussed later in this article) will often tend to be quite hard work as the eyepiece can end up in strange positions requiring the user to either rotate the telescope in its mount (which can be hard with a heavy telescope) or become adept at Yoga. Reflectors also require a process known as collimation to align their optics periodically. While not exactly rocket science basic collimation is probably the second most frequently asked question on astronomy forums (after 'what telescope do I buy ?' ). While it can be mastered with some practice it can be confusing for beginners and carries a potentially steep learning curve. This should not put you off however. Whatever telescope you buy will have its own demands on the user and you will need to master many skills in the hobby. Reflector Pros - Biggest bang for the buck in aperture - The best option for deep sky work - Simplest to use manually (when mounted as a Dobsonian) Reflector Cons - Requires collimation and maintenance - Less rugged than other types - Potentially bulky and heavy when EQ mounted. SCTs, or more correctly Schmidt Cassegrain Telescopes use a novel method of creating a very long focal ratio by 'folding' the optical path inside the telescope. This simple idea allows for the telescope to be rather compact. SCTs because of their more complex optics are generally (along with the Maksutov) among the more expensive types available. SCTs provide powerful magnifications and light capture and generally they are good all-rounder type telescopes. Their relatively long focal ratio makes them suitable for planets while the larger SCTs have a light grasp equal to a Newtonian Reflector however a side effect of their design reduces their field of view compared to an equivalent reflector. The picture to the left shows a Nexstar 4SE, one of a range of low cost Maksutov/SCT telescopes from Celestron. The field of view of a telescope is basically how wide a view it can see. Planets don't require a very wide field whereas some deep sky objects such as nebula are very diffuse and spread out. As a result for some deep sky objects the widest field of view is required. SCT and Maksutov designs have much narrower fields of view than a reflecting telescope. This isn't generally a problem to the beginner to astronomy. SCTs, like refractors, are relatively hardy but they may occasionally require collimating like a reflector. Because of their small size (but don't be fooled they can be quite heavy) SCTs are often the scope of choice for those requiring portability. Also because of their short length they are the scope of choice for manufacturers to offer with automatic GoTo style mounts. SCTs are nearly always the most comfortable scopes to use as their eyepiece position stays relatively the same regardless of the direction they are pointing due to their short length. One of the big downsides however to SCT and Maksutov telescopes is the long cool down time. For a telescope to meet its best optical performance its lenses need to be at the same temperature as the surrounding air. Most telescopes reach ambient temperature relatively quickly but because of their closed design SCTs and Maksutov types need a longer cool down time. A Large SCT or Maksutov may require as much as 4 hours. Another downside to the design is under dew laden conditions very common in the UK the SCT and Maksutov types tend to suffer worse than other types and may end up requiring dew heaters to keep their optics clear. Dew heaters perform the same function as the electric heated rear window in your car. The Maksutov design is basically a folded refractor which allows the aperture size to increase without creating a telescope that would be unwieldy, heavy and difficult to mount. Like the SCT type telescope Maksutovs, especially in larger sizes, are among the more expensive designs and they also suffer from the same problems as SCT types with regard to long cool down times and dewing. Magnification - how big can you get ? How low can you go ? Most beginners in astronomy assume that the key factor in any telescope is how big it makes things appear. Strange as it may seem a telescopes primary role is not to magnify but to gather light. The magnification of any object in a telescope is largely a factor of the eyepiece that is plugged into the telescope. Generally speaking a telescopes magnification is limited to 2x the size of its primary optic (either the primary mirror or the main lens.....so a telescope with a 100mm main lens would have a maximum magnification of x200 (2x 100=200). 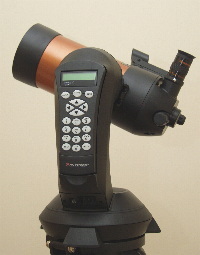 The actual magnification is carried out by the telescopes eyepiece. These come in a range of sizes and types but typically a telescope would be supplied from the manufacturer with something like a 10mm and a 25mm eyepiece. The eyepieces magnify an object based on the telescopes focal length divided by the eyepiece size. So for instance a telescope with a focal length of 1000mm with a 10mm eyepiece would give magnification of x100 ( 1000/10=100) while the 25mm eyepiece would give x40 (1000/25=40mm). So how big can you get ? Theoretically a 200mm (8") Reflector can achieve x400 magnification but in reality the seeing conditions of the sky are the limiting factor and quite frequently the maximum achievable is no more than x200. EBay and store type telescopes promising x700 are blowing smoke and are best avoided. TELESCOPE MOUNTS - What's the difference ? Like telescopes mounts come in a wide variety of types with various features. A general rule is always buy the biggest mount you can afford for your telescope. No one ever complains that their mount is too steady. The quality of the mounting can have a huge effect on the quality of the views. A wobbly mount will never allow you to exploit the full potential of your telescope and will only ever be a cause of frustration. Manufacturers usually package telescopes and mounts together in various combinations and to get the price down they will sometimes package a telescope with an underspecified mounting which means your beautiful big telescope will never be allowed to perform well. This section will explain the basic mounting types. Its not a fully comprehensive list but covers the main mounting types that are commonly available. Alt Az (short for altitude-azimuth) is the simplest of all telescope mountings. It's designed to allow the telescope to point up and down and left and right. Alt/Az mounts come in various forms ranging from something which looks similar to a camera tripod through to fully automated GoTo systems using a forked mounting. Generally speaking Alt/Az is mostly used for SCT and Maksutovs when coupled with a GoTo mount. Alt/Az Pros - Simple to understand and use. Fast set-up when not automated. Alt/Az Cons - Can end up being a pain when you realise how fast celestial objects move and how tough it is to track them (manual mounts only). The Equatorial mounting (more properly called a German equatorial mount or GEM but most often referred to as an EQ) is the standard mounting for many types of telescope. The advantage of a standard equatorial mount over an Alt/Az is that the mounting is designed to track the motion of the stars. Once properly aligned to the pole star the mounting can be moved using a single slow-motion control to track the stars. These are commonly motorised to allow the mount to automatically follow the star. This is not the same as GoTo and only allows the mount to move at the same rate as the stars to track objects. It doesn't help you find them ! The advantage of the EQ style mount is offset by the fact that it's a relatively complex piece of equipment and there are no shortage of beginners on astronomy forums asking for help using these. If you have any interest in progressing to astro-imaging then this is the mount for you because you will sooner or later have to use one if you intend to do astro-imaging. Another downside is the bulk and weight of an EQ mount. To adequately mount a larger telescope the EQ mount size increases AND it requires counterbalance weights which can easily hit the scales at 10kg-15kg which, when combined with the bulk of the mount itself can add up to a hefty weight of gear. EQ mounts come in a vast range of sizes from the small Sky-Watcher EQ1 for small telescopes through mounts costing many thousands of pounds. 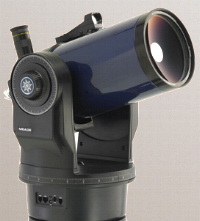 Some people prefer EQ mounts for observing as the convenience of having the mount track objects makes for less hassle when observing. . Any type of telescope can be used with an EQ mount but very large reflectors usually employ a Dobsonian mounting as the cost of an EQ mounting would be prohibitive. EQ mounts are a must for anybody wanting high magnification on planets. Planets tend to move quite fast and if you are endlessly having to move the telescope it can be a bit like chasing a chicken. Eache movemt will cause the telescope to wobble slightly and by the time the view has settled down you need to move again to keep the planet in view. An EQ mount with at least a motor for tracking will make the whole experience less frustrating. Its also very useful if you have a child or other observers in mind. Without it as you change places at the eyepiece the object may well have moved out of sight each time leading to a frustrating experience. The picture shows the Skywatcher HEQ-5 equatorial mount - a popular medium sized mounting which provides motor driven controls, tracking and is most often equipped with GoTo. Equatorial (EQ) Pros - Makes it easier to follow celestial objects, a must for planets. Equatorial (EQ) Cons - Beginners are often confused by EQ mounts due to their relative complexity, Heavy. The Dobsonian mount is basically a simple turntable that supports the telescope and allows it to point up and down. It's essentially an Alt/Az mount designed solely for large reflecting telescopes. This method of mounting is almost only ever used for reflectors and is, for the amateur, the most practical method of mounting large heavy reflecting telescopes. 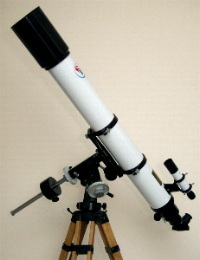 The picture shows a Sky-Watcher 'Flextube' Dobsonian. A popular choice which provides a relatively low cost, large aperture telescope which can fold down to a smaller size for storage and transport. Dobsonian Cons - Some users find constantly having to nudge the scope to follow objects difficult and/or annoying. GoTo is not so much a mounting as an add on to other mount types or a system built into the mount at the factory. GoTo consists of motors, a motor controller and a handset which contain the electronic elements to automatically align the telescope to any celestial object. They normally contain databases of around 15,000-40,000 objects. Bear in mind many small telescopes sold with a GoTo mount may well have a directory of 15,000 objects but chances are only a very few will be viewable because of the small size of the optics of the telescope. GoTo can be applied to almost any style of mount but it's most normal for manufacturers of SCTs on fork mountings to supply GoTo as part of the basic mount specification. On EQ mounts it can be added onto some manufacturers mountings or can be built into the mount. 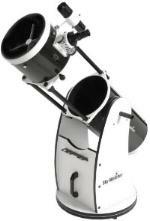 Recently some manufacturers have created GoTo Dobsonian mountings but these are, at the present time relatively rare. However, Dobsonian mounts may have what's known as 'Push To' whereby a controller will tell you where to point the telescope but you have to push the telescope to its position. Don't be fooled though by assuming GoTo is the answer to a beginners prayers. Paradoxically GoTo can be a relatively complex set-up in itself with its own steep learning curve to master and when applied to an equatorial telescope it may require you to be able to identify stars as part of the alignment process. GoTo Mount Pro - Easy to locate objects and track them. Can be a boon for the novice. GoTo Mount Con - Can be a learning curve in its own right, small scopes may sacrifice optical quality for electronic wizardry. GoTo is often a bone of contention among amateur astronomers. Some will argue that GoTo removes any skill and kills the excitement of finding objects for yourself. Others will argue that GoTo opens up the sky for beginners. Which solution is right is down to the individual. I have seen beginners start the hobby determined to learn the sky and do without GoTo who have ended up giving up the hobby in frustration. The general poor weather in the UK can limit available nights for seeing and when that is coupled with other commitments ( family, work etc) it can reduce the available time to learn the sky to a bare minimum and lead to a large amount of frustration when you have a large scope but cant ever find anything to look at. Alternately I have seen others start the hobby with GoTo and find that it lacks any thrill. Simply pressing a button and letting the scope do all the work can kill the thrill for some people. Which one is right for you depends on how much time you wish to devote to the hobby. One thing you should be very clear about though is that GoTo is absolutely NOT like using your home DVD player or other household electronics which are 'automatic'. GoTo nearly always requires a reasonable amount of skill from the user to get it set up correctly. Don't allow any 'snob' attitudes to dictate your choice on GoTo - be realistic in your expectations of how often you will be using your telescope and budget and buy accordingly. Heaven or Hell with GoTo is a very individual choice and experience. 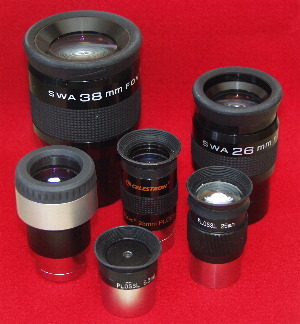 Pictured a range of eyepieces in 1.25" and 2"
fittings from Vixen, TAL, Celestron and Skywatcher. The eyepiece of a telescope is the bit you actually look through. On an astronomical telescope these are usually removable. The eyepiece, coupled with the telescopes focal length determine the magnification of the view . Beginners to astronomy are very often perplexed by eyepieces but its really quite simple. Eyepieces come in a big range of types and sizes but most usually their size is given as their barrel size which is usually 1.25" or 2" and their optical size which will be expressed as millimetres - this is the eyepieces focal length. The focal lengths of eyepieces vary from 2mm to 40mm for astronomical telescopes. 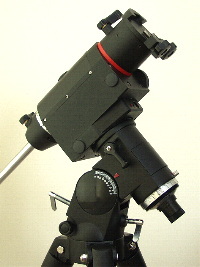 The barrel size is to accommodate a wider angle view but not all telescopes have a focuser that can accept a 2" fitting or could not make use of it if they did. Similarly high powered eyepieces have a narrow field of view so are seldom supplied in a 2" fitting as they would not benefit from it. Generally good quality astronomical telescopes have a fitting for an eyepiece that's in line with their capabilities. The smaller the focal length of the eyepiece the more the eyepiece magnifies the view (see the section above on magnification) and this is an area where many beginners make their first big mistake in astronomy (see the section below). Bigger IS NOT better ! Most beginners assume that the thing to have in a telescope is MASSIVE magnification and quite often beginners will rush out and buy the eyepiece which will give them x400 magnification and then find its completely unusable. The fact is that most astronomy is carried out at no more than x200 and quite often less than that ! Weather is the biggest factor. As magnification gets bigger so does the view, unfortunately so does the disturbance in the atmosphere. This can reduce a high powered view to looking as if your viewing through running water. The other factor is the telescope itself. The maximum magnification any telescope can take is 2x for each mm of its aperture. So a typical starter scope with a 130mm aperture only has a maximum magnification of x260. In reality many scopes don't perform well at better than 60% of their theoretical maximum so a 130mm scope is seldom adequate for more than x150. Obviously the quality of the optics comes into play here and a good quality telescope may well be able to exceed its maximum stated performance while a poor quality telescope may very much under-perform against its theoretical ability. For all these reasons beginners are often disappointed with a high powered eyepiece. Astronomers generally place a bigger premium on wider angle views using 10mmm - 30mm eyepieces for deep sky viewing. High powered eyepieces are generally only used for planets and the moon and even then conditions are seldom good enough in the UK to go to much higher than x200. High powered eyepieces are also, for many people, uncomfortable to use. Eyepieces are a very complex topic and this article is really only to acquaint you with some basics. Your telescope will almost certainly come with an eyepiece or two from the manufacturer along with a Barlow lens. These are seldom the best quality eyepieces but are there to get you started. A Barlow is a special kind of lens that doubles the magnification of any eyepiece thats used with it. Faster focal ratio scopes of F5 and below will be more demanding on eyepieces to get the very best views due to a condition known as coma which causes the 'fast' optical design in some refelectors to create elongated star shapes. Don't however let that put you off. Most beginners are perfectly happy with the views through only low and medium costs eyepieces from quality manufacturers with scopes of around F5. Higher speed scopes down to F4 can however be VERY demanding and the quality of views may suffer with anything but the best quality eyepieces. Eyepieces can range in price from £10 through to £600 !!!!!!. The difference is in the optical quality and the eyepieces ability to keep the view free from any optical defects. It seems expensive but in reality an eyepiece is like a lens for a camera. Cameras are often quite relatively inexpensive but good quality lenses are mostly very expensive. It's the same relationship between a telescope and a camera. Just make sure that when you buy your telescope it comes with at least fittings for 1.25" eyepieces. One of the buzz words you will hear when talking about eyepieces is 'eye relief' this is the distance between the glass of the eyepiece and your eye. If the eye relief is too far away you will feel as if you are standing back and looking down the barrel of a ballpoint pen. If its too close you wil find it uncomfortable, and if you wear glasses, perhaps impossible. The more powerful the eyepiece becomes (shorter focal ratio) the less eye relief there will be. Thats another reason why beginners are often put off with high powered eyepieces. As time goes by and you acquire experience you will know what types of eyepieces will be good for both your telescope and for you. One of the big things that often brings beginners to astronomy is astro-imaging and the idea of taking some fantastic photographs of nebulae and galaxies. Its also the fastest way out of the hobby for many people ! Years ago when I started astronomy in the 1970s astro imaging was technically challenging, complex and expensive. Heres the news - it still is ! If you think your going to bolt your new digital camera to a telescope and get NASA quality pictures like you see on the web and in magazines then think again. Most of the pictures in astronomy magazines and books were taken by people with multi thousand dollar set-ups and the techniques have likely taken them years to master. 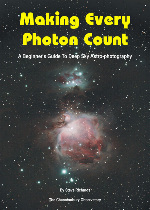 If however, you have decided astro-imaging is the be all and end all I could only recommend you get a good beginners guide to astro imaging such as Steve Richards very excellent book 'Making Every Photon Count' which is considered excellent by no less a personage than Sir Patrick Moore himself. Astro imaging is a science bordering on a black art which is a vast topic with very many complexities but Steves book will give you the best possible start and its written with complete beginners in mind with plenty of pictures. Steve covers everything you will need to know to get you started and to give you an understanding of the challenges and the equipment involved. Generally speaking astronomy is a steep learning curve without introducing the complexities of astro-imagine and I would advise any beginner to learn the basics first before attempting to jump in to one of the most technically challenging aspects of the hobby. Many astronomers when asked will suggest getting involved with an astronomical society. While a good local society can be very advantageous there are also rather dull societies and some, sadly, have the sorts of people who would put you off for good. I'd suggest get online - you found this article so click around and find an online bulletin board like stargazers lounge. You'll find plenty of friendly folk in there who will help. Astronomy is more than kind to beginners and older, wiser heads can advise, help and share knowledge. There's very little snobbery in astronomy so don't be afraid to join in on a web board and ask questions. The next best resource for the beginner is to look out for star parties or public events you can go along to. Astronomers are very often incredibly generous with their time and this will allow you to get a look through a few different telescopes and form a better opinion of what you need. Finally a good resource that is often overlooked is a good dealer. Reputable dealers will talk you through the pitfalls and help you choose a telescope that's right for YOU. Remember not every scope is perfect for everyone and you need something that you like and will use. Reputable dealers can talk you through the issues and advise you and most importantly be available to take support calls if you have problems. I wish you luck and clear skies in your forthcoming astro adventures.